A look at the original ad for Scottie Pippen's first official signature shoe. Scottie Pippen had been with Nike since the late 80's and was known for wearing many great shoes like the Air Flight 89, Air Maestro, Air Up PE, and of course, the Air More Uptempo. Many consider the More Uptempo to be a Pippen signature shoe, but it wasn't until 1997 that Scottie got his first official signature shoe bearing his name. A close relative to the Air Max Uptempo 3, the Air Pippen 1 featured a full length visible Air Max unit as well as its most distinguishing design component, the jeweled zig-zagging piping that runs the length of the shoe. Scottie would later opt for a custom Zoom Air version of the Air Pippen in favor of its better court feel than the Air Max. He obviously preferred Zoom over Max from then on because every later Pippen signature shoe utilized Zoom Air and a sleek design, unlike the bulky Air Max shoes like the More Uptempo and Uptempo 3. 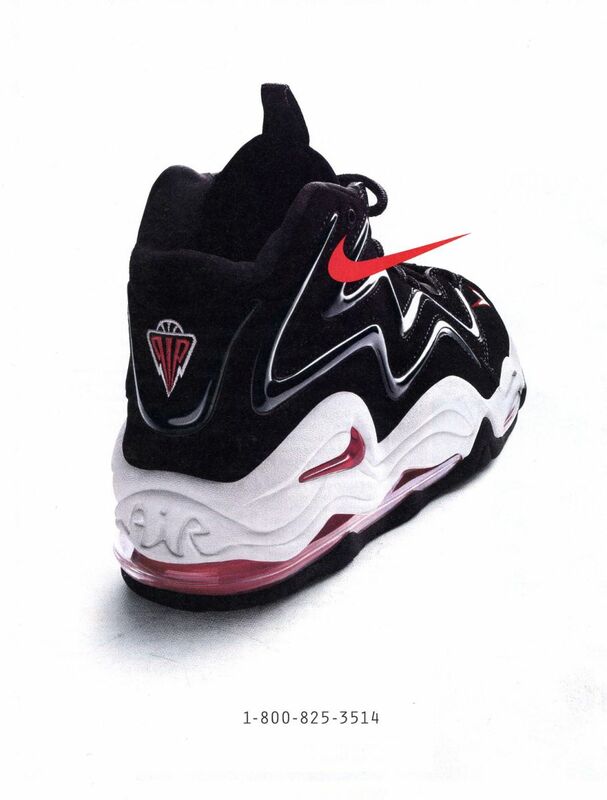 In this ad, another of the greats from Nike's minimalist ad campaign, we see the Air Pippen in its original black, white and red Bulls-inspired colorway.